Is it easy to be a missionary? NO! Is it rewarding? YES, ABSOLUTELY! We are here in the Philippines responding to a call from God. Many years ago, in a vision, the Lord commanded us to “go as a bridge to the islands…!” He told of many wonderful things would happen. The Word of the Lord is tried and tested in the fires of human experience. Today I will share about something that could have knocked us out, apart from the Lord’s Sovereign help. God is faithful! An armed intruder entered into the buildings at our mission base in the islands. We had guests, who were sleeping in a nearby room that was securely locked. Colleen (my wife) and I were sleeping in an unprotected room in an unfinished part of the building that was under construction. There were no doors or windows installed yet, at the time. We had barricades in the doorways, but they unsecured. Dogs were barking long and loud around 3 a.m. When one of our teammates got up to use the restroom (an outbuilding), she safely returned to her room, although she heard dogs barking and thought she heard footsteps at the time. A short time later, there was a huge explosion. It was so loud that it sounded like dynamite. Colleen and I awoke from sleep. Our initial shocked thoughts were not that it was noise from a gun being fired. We thought the sound must have been from a coconut falling on our newly constructed metal roof of the building, and I was thinking of the serious importance and need for us to regularly prune the coconuts from coconut trees located around the building. Then, there was another deafening explosion! When I heard shouting, and then loud noises and commotion coming from the church building right next to where we were sleeping – we knew that we were all in very serious trouble. We were sleeping on an airbed with a mosquito net ‘tent type’ frame surrounding it. The mosquito net was difficult to to zip and unzip because of a broken zipper problem. Before we were able to go investigate and see what was going on, the masked gunman appeared through the doorway with one of our pastors held as hostage at gunpoint, threatening us, and saying this was a hold-up, and demanding money from us. Previously to that, the assailant had entered our church building which is located nearby, at the mission base. It was being remodeled, and undergoing new construction at that time, as well. It was also unsecure – with no doors or windows installed in it. In the church facility, there is a loft (2nd story room) underneath the ceiling in part of it. There was a temporary ladder leaning on the floor, and going up into the loft, where three men on our team were sleeping. The intruder climbed the ladder, and apparently pretended to be looking for someone. The men were taken by surprise there in the darkness, and shined their bright flashlight into the face of the intruder. They clearly saw him, and recognized him a a man from a nearby area. At that time, he had not yet put on the mask to cover his face. The intruder climbed back down the ladder, concealed his face with a cloth mask, and then began his vicious assault of us by demanding one of the men to come down from the loft, threateningly firing his gun for emphasis to prove his point. Under compulsion, one of our pastors climbed down the ladder from the loft in compliance with his demand and tried to talk and reason with him regarding the unreasonable demand being made for money. The assailant impatiently accused him of being stubborn, immediately firing the gun again and shooting him in the foot. He was taken hostage at gunpoint, and with the gun pointed at our pastor’s head the gunman demanded that he be taken to the Americans. Our sleeping area was very near. When the assailant and hostage entered our dark room, there were no lights. The electricity is regularly shut off at midnight in that area. It was pitch black, except for the headlamp strapped onto the head of the assailant. The trespassing assailant forced his hostage to come through the door before him into our sleeping area, with his loaded gun pointed at his head, threateningly. 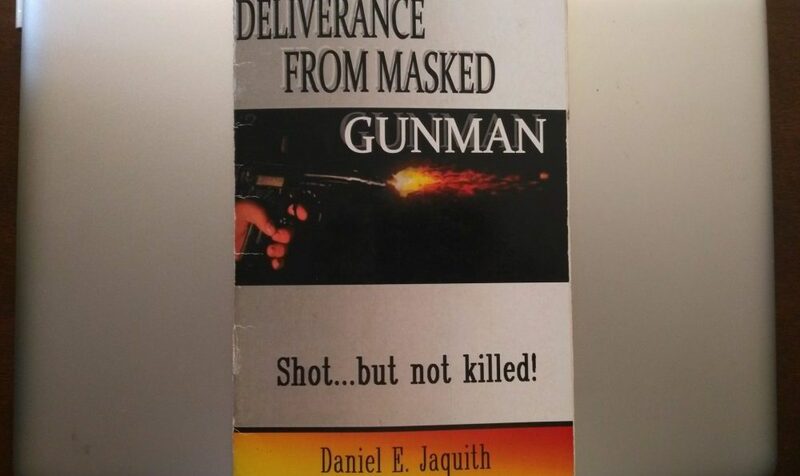 The hostage stood there in front of us, with the gun pointed at his head, and blood oozing and pooling on the floor at his feet from his wounded foot that had just been shot. This was not just a nightmare-ish dream – this was for real! Crying out to the Lord! However, Colleen did not want me to do that, and I honored her desire. In our desperation and distress, we both began to unitedly cry out to the Lord, with very loud and intense voices. I prayerfully went to my knees, with Colleen there right beside me on our bed. With the loaded gun pointed at us, the man kept saying (in Tagalog) “Stop praying! Stop praying! Give me the money or I will kill you!” We continued to pray! Who was this man to try to stop us from praying to God? Our guests, several elderly ladies from the States, heard the commotion. One of them left the security of their room and came to where we were, right into the midst of this dreadful and dangerous scenario! She wanted to know what was going on. She had heard us praying and wanted to join our prayer time! When I urgently ordered her back into her room, she quickly made a hasty retreat, praise God! As we continued to pray and cry out to the Lord, the pastor (hostage) suggested to the gunman that he look in our bags located near to him there on the floor. He momentarily left his hostage standing where he had been held captive at gunpoint and began looking through our suitcases for money. The hostage, taking advantage of that momentary distraction and diversion – and with a slight reprieve from the gun being pointed directly at him grabbed a nearby plastic chair and broke it over the head of the robber. It literally shattered into many pieces with the impact. All of this was happening just a few meters or so away from where were located there on the bed. As the chair violently came down, the impact also bruised the back of my leg behind my knee with a big swollen lump and huge black and blue bruised spot that was extremely painful for several months. The gunman had been holding us at gunpoint, as well, with his loaded gun. Obviously, he held the gun in hand, with his finger on the trigger. We are so thankful that the robber didn’t violently react in shocked surprise when the chair unexpectedly crashed down upon his head, and pull the trigger on the gun right then! The hostage and assailant began combat with a hand to hand wrestling match, grabbing and pushing and hitting each other, as they both fought for control of the gun. The hostage was extremely brave, risking his own life, with a foot that had just been shot and that was bleeding profusely! He attempted to grab the loaded gun from the gunman who had just shot him – and to valiantly protect us! During the course of this time, the assailant was pulled to the far side of the room, away from where we were. The loaded gun was shot several more times during this time of combat. The assailant pointed back toward us with at least one of those shots, and a bullet ripped through my left arm, between my elbow and wrist. When I cried out – “I’m hit, I got shot” my wife was terrified! “Where are you shot?” “My arm, my arm… I got hit in the arm”, I said. Of course, that was a very traumatic moment for my wife. She was there in the dark, right by my side during this whole episode. Needless to say, she was about beside herself with anxiety, distraught, and very concerned… She lovingly took off the pillowcase there on our bed and wrapped it tightly around my arm – as it was already bleeding profusely! We then lay down together on our bed to hopefully lie low and keep ourselves from being shot again, as I put pressure on the wound to slow down the bleeding. Meanwhile the life and death struggle for control of the gun continued between the hostage and gunman. This was not only a very traumatic experience for both of us to go through there on our bed together, it was life-threatening! That shot could have hit us most anywhere, and certainly could have been a fatal shot to either one of us. Thankfully it was just my arm that got shot, and not one of my vital organs like the lung, heart, or head! It was so-o close! I am most thankful that it was me and not my wife that got shot! That would have undoubtedly been the saddest day of my life if it had been her! I took the gunshot, but my wife probably received the worst emotional shock, seeing and hearing her husband get shot, and become a bloody mess, right there in front of her eyes. It was like a dreadful nightmare that’s been difficult to recover from. Finally the hostage over-powered the assaulting robber and wrestled the gun from his hand, at which time the gunman ran out of the building, and disappeared into the darkness. After the masked gunman left, we all gathered inside the secure room where our guests had been sleeping. We needed to wait for the light of day, when it would be safer to go to get assistance and care for our gun wounds. We praised the Lord for delivering us from this evil man, and we prayed for him as well. Obviously, we were quite traumatized, but our hearts were full of thanksgiving to the Lord that this dreadful scenario had not been any worse. Although wounded, our lives had been spared and we were so grateful! It so easily could have been a much more tragic scene! During prayer that morning, one of our guests received a vision of angels standing closely together, surrounding and encircling our buildings there at our mission base. Song: Let The Redeemed of the Lord say so! It was amazing that earlier that morning, before the robber appeared there in our bedroom, I had been dozing in and out of sleep, thinking especially about Ps. 107:2, and meditating about being redeemed from the hand of the enemy. Realizing it was a special “rhema” word from the Lord for us, I was already planning to share that verse in our regular devotional time that morning with our team – not knowing at that time that we would be rejoicing together for literally being delivered from the gunman’s death-threatening hand that day! That morning I began singing the song – “Let the redeemed of the Lord say so…” and finished putting that song to music shortly after our deliverance from the gunman. We were able to sing it with our congregation at our next Sunday service after we returned home. I was able to rejoice and sing before them, with a left arm that had been severely wounded, yet playing the guitar. God is good! Let the redeemed of the Lord say so! Let the redeemed of the Lord say so! I’m redeemed from the hand of the enemy – I’m redeemed by the Lord and He set me free! I’m redeemed, praise the Lord! I give thanks to the Lord for He is good – for His mercy endures forever! I give thanks to the Lord, He heard my cry – in my distress He came to deliver! I give thanks to the Lord, and bless His name – yesterday, today, forever the same! For His mercy and HIs goodness, I will proclaim! Praise the Lord! I give praise to the Lord for He is good – my Savior and Redeemer! I give praise to the Lord and exalt His name, He sent His Word – He is my Healer! I give praise to the Lord, He is my King – praises to HIs name, I shout and sing – with rejoicing in my heart, sacrifices bring! Praise the Lord! I will worship the Lord for He is good – He’s my wonderful redeemer! I will worship the Lord with all my heart and declare that He’s my Savior! I will worship the Lord for His wonderful works, powerful, victorious, glorious works! In my trouble He is with me giving victory! Praise the Lord!